Buried at: K.I.A. & M.I.A. Funeral location: NO FUNERAL. K.I.A. & M.I.A. Hodder was attached to the Brigade Head Quarters and was hit about the end of June by a shell when in his dug out which blew off both his legs. His mate, Gordon Farnham, dressed his wounds and passed him on to the Dressing Station. Informant heard that he was in Egypt and still alive. Informant says he was told that Hodder had his leg blown off. He cannot say who told him nor can he fix the date. Hodder was a policeman at Broken Hill and he and several policemen came down with informant to Adelaide to enlist. 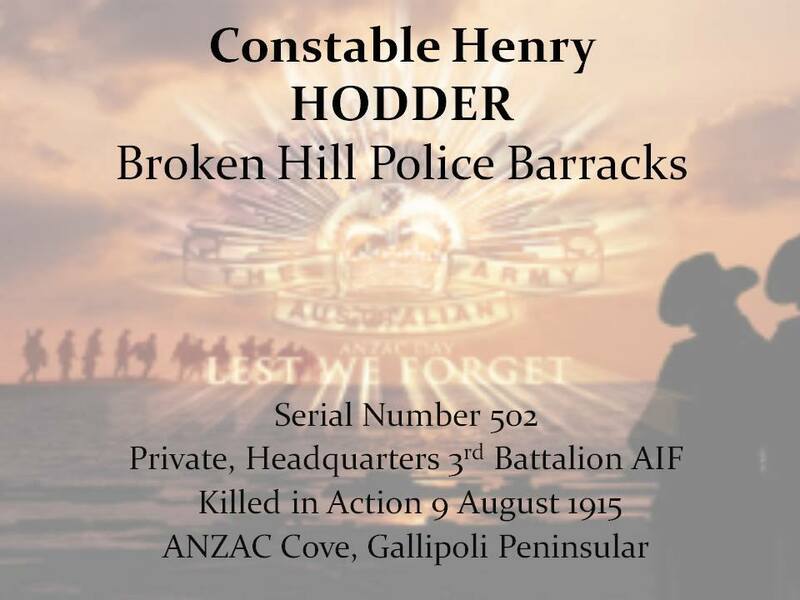 Hodder was at one time in the 3rd Bgde. Transport. Whilst Hodder was doing police duty on the beach at Anzac during July, a shell exploded in the dug-out almost severing both legs and arms from body. Was sent back to Egypt and believed to have died in Alexandria. He and Pte D. Fisher were in Police Duty at Brigade headquarters on August 6 and were each hit by same shell. Hodder had one or both legs blown off and Fisher lost one or more limbs. Witness did not see this happen but heard it from mates and regarded it as absolutely ture, but could never find out what became of either of them subsequently. About 5ft 10 or 11, fair, clean shave, enlisted in South Australia, stout build, about 12 or 13 stone. Both legs were blown off by a shell explosion whilst in his dug-out behind the trenches to the right of Lone Pine. He died in the dressing station on the beach. Informant received the above account of Hodder’s death from J. Thomas, Stretcher-bearer, 10 A.I.F. Court of Inquiry held in France 7.9.17 found this soldier K. in A. on or about 9.8.15. No hospital admission nor place of burial available. The above pd[divider_dotted]f document is a ‘broader’ copy of the above text.